I Love Arnside & Silverdale: Good Swallow movement over Leighton Moss. Doing a Swallow count at Silverdale. The area I chose to count from was at the beginning of the small track in the Warton direction, which comes up shortly on the right hand side, just after crossing over the railway track. This track if you where to carry on would take you under the railway to the car park for the Allan and Eric Morecambe Hides. Just the place to be and I had 379 Swallows over 109 minutes, which is pretty good going in my opionion. The best parties as you can see were: 35,28,24, and 20, etc. 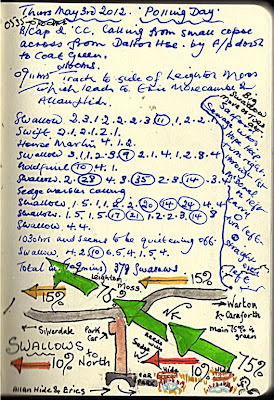 You can see from the sketch that the birds are coming through on a broad front, but without doubt 75% of the birds had a very small direct corridor (shown in green) of about 100 yard wide, and they seem to come up from crossing over the reedbeds in front and then crossed over the road just in front of where you parked the car (could never have chosen a better spot!). If this is what I got with such a late start, it probably means that there could well have been over 1000 birds if I had been there from first light. Sadly owing to other committments I cant start the counts before 0900hrs, but weather OK I'll give it another try tomorrow!! Also had a few House Martins and Swifts, and a ten party of Goldfinch moving through which probably would tie in nicely with the large falls of continental birds over the past few days.